Jonathan Witthoeft has been working with the Grid Connect team for the past five years. After hearing about Grid Connect from a friend, he applied for a technical support position while finishing up his degree in electrical engineering. 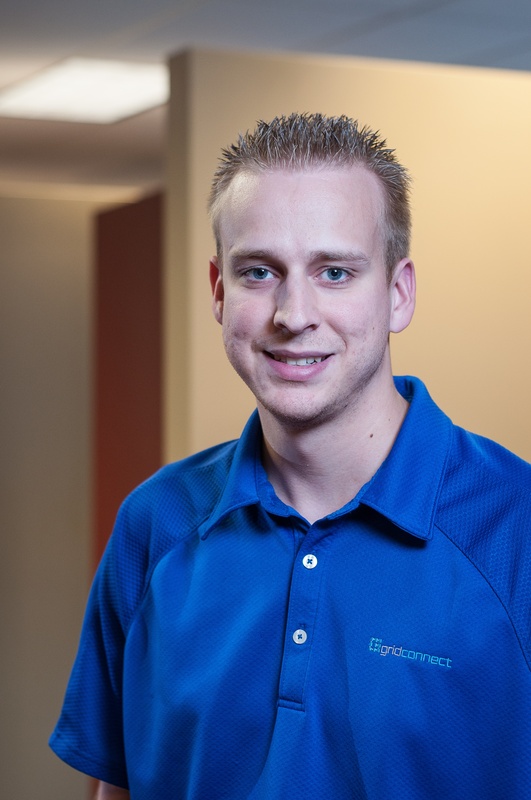 After spending three years leading tech support at Grid Connect, Jon has fully transitioned to a software engineering position where he spends much of his time working on various ZigBee and Bluetooth Low Energy (BLE) projects. Beyond spending his time working with ZigBee and BLE and taking the occasional tech support call, you can find Jon playing ping-pong with the Grid Connect "A" League or playing (and usually winning at) a game of Bags. Jon says that his favorite part of working for Grid Connect is the people. "Everyone in the Grid Connect family is friendly and easy to work with. It makes a great atmosphere to get work done and keeps us all happy and productive." Jon was married less than a month ago to his beautiful wife. In his spare time, he enjoys watching Game of Thrones with his wife and their fur babies as well as attending movies and sporting events, and spending time with friends. Connecting products to the Internet of Things (IoT) is essential to manufacturers looking to stay competitive within their industry. Adding IoT capabilities allows the manufacturer to stay connected with their customer, while discovering new product uses and applications that open them up to new revenue streams. However, these added benefits come with a cost. Connected devices come with a higher manufacturing overhead, but may also be sold with a bigger price tag. Wi-Fi and Ethernet connections can be added to products for less than $10 in bill of materials costs. Other technologies, such as ZigBee, Z-Wave and Bluetooth, can be added for a lower price, but may require a separate bridge to connect to the Internet and access Cloud services. To download the complete Internet of Things Design Considerations White Paper, click here.